California Governor Signs School Vaccination Law : The Two-Way Starting July 1, 2016, all children enrolled in public or private schools or day cares in the state must be vaccinated, regardless of parents' religious and other personal beliefs. Gov. 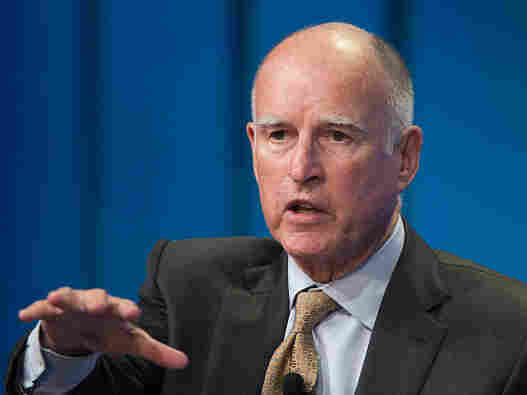 Jerry Brown of California signed a controversial vaccination bill into law on Tuesday. California Gov. Jerry Brown has signed off on one of the strictest school vaccination laws in the country a day after the state Legislature gave the measure final approval. "The science is clear that vaccines dramatically protect against a number of infectious and dangerous diseases," Brown said in a signing statement. "While it's true that no medical intervention is without risk, the evidence shows that immunization powerfully benefits and protects the community. Starting July 1, 2016, all children enrolled in public or private schools or day cares must be vaccinated against whooping cough, measles and other diseases, regardless of parents' religious and other personal beliefs. Children with specific medical conditions, such as immune system deficiencies, may be exempt if they have a doctor's note, according to member station KQED, which has a list of required immunizations. The station says that "those who opt out will have to be home-schooled or enroll in an independent study program off school grounds." " 'From the moment the very first vaccine came on the scene, which was the smallpox vaccine, there has been resistance to vaccines and vaccination,' says Elena Conis, a history professor at Emory University and author of Vaccine Nation: America's Changing Relationship with Immunization. She says that the modern-day resistance movement shares its roots and rhetoric with the social movements of the 1960s and '70s, including feminism, environmentalism and consumer rights.
" 'They encouraged people to question sources of authority, including doctors,' she says. "For example, women's advocates started to question medical advice on reproductive health and childbirth." As we reported previously on The Two-Way, the bill was introduced following an outbreak of measles centered on Disney theme parks in California last December that sickened dozens of people.